Youth protest at N’Assembly over not too young bill – Royal Times of Nigeria. 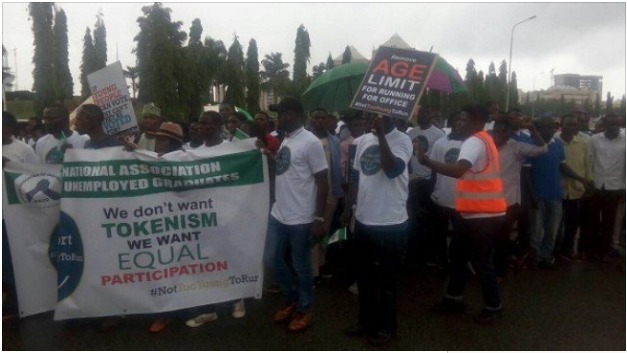 A group of youth on Tuesday made a peaceful protest at the National Assembly to demand the passage of the ‘not too young to run’ bill. Chidi Odinkalu, former chairman human rights commission, while addressing the protesters said the youth were the future of the country. Odinkalu said: “We are in a country with median age of 19 but people who want to save Nigeria’s unity have an average age of over 60,”. “Who are they saving the country for? People are being invited across the country as leaders of thought, who are they thinking for? At our age, average age of the Nigerian youth given our life expectancy, we are already in the middle age and life expectancy for women is 51 and falling, for men it’s 49 and falling. “So if you are in your 20s, you are in your middle age people like me are already in injury time and people like us should be seeking to replace ourselves with the kind of people who are leading the not too young run movement.